In this August 3, 2016 file photo, the Facebook app logo is displayed on an iPad next to a picture of the Facebook logo on an iPhone in London, England. In its latest attempt to wrest control of the Internet, Russia's communications agency on Tuesday threatened to block access to Facebook if the company refuses to store its data locally. Alexander Zharov, chief of the Federal Communications Agency, told Russian news agencies on Tuesday that they will work to "make Facebook comply with the law" on personal data, which obliges foreign companies to store it in Russia. Critics have slammed the law, which went into effect in 2015, for potentially exposing the data to Russian intelligence agencies. Zharov said that the Russian government understands Facebook is a "unique service" but said it will not make exceptions and will have to block it next year if Facebook does not comply. Last year, Russia blocked business-focused social network LinkedIn after a court ruled it violated the law on data storage. LinkedIn is available in Russia only if accessed via proxy servers. 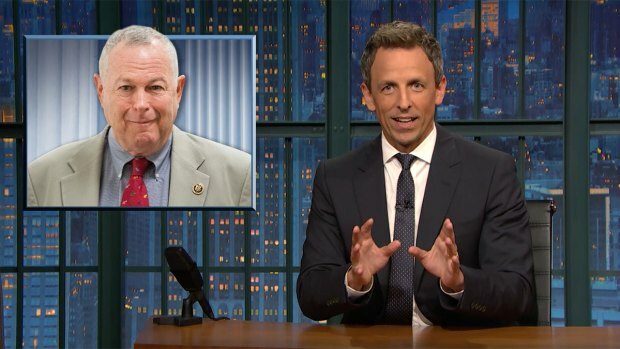 'Late Night': Checking in With Rep. Rohrabacher of Calif.
Seth Meyers takes a break from breaking news to talk about Rep. Dana Rohrabacher, R-Calif., and his relationship with Russia. In the most recent step to crack down on Internet freedom, Russia's parliament in July outlawed the use of virtual private networks, or VPNs, and other Internet proxy services, citing concerns about the spread of extremist materials. Russians use VPNs to access blocked content such as LinkedIn by routing connections through servers outside the country. The law obliging companies to store personal data about Russian citizens in Russia has been applied selectively since it came into force two years ago. It has been widely viewed as the Kremlin's attempt to expand control over the Internet. Russian Internet freedom activists have urged international tech companies to reject the government's calls to give them access to personal data, saying that this would undermine cybersecurity for millions of Russian users. Leonid Levin, chair of the parliamentary committee on communications and information policy, in comments carried by the Interfax news agency on Tuesday expressed hope that "it would not come to" blocking Facebook and that Russian authorities would be able to negotiate with the U.S. company.